Imodium (loperamide) is an opioid receptor agonist that binds to opioid receptors in the gut wall reducing peristalsis (antimotility drug). Loperamide is indicated for the symptomatic relief of acute diarrhea and is generally considered very safe in adults. Its use in children, however, has been discouraged by the World Health Organization and the American Academy of Pediatrics owing to concerns over safety and efficacy in young children., There have been rare reports of fatal paralytic ileus associated with abdominal distension. Most of these reports occurred in the setting of acute dysentery, overdose, and with very young children, less than 2 years of age. In children under the age of 3 years, especially if they are malnourished, dehydrated, systemically ill, or have bloody diarrhea, adverse events outweigh benefits. In children who are older than 3 years with minimal or no dehydration, loperamide may be a useful adjunct to oral rehydration and early refeeding. Coronary arterial spasm as a potential complication of loperamide has been debated in adults. The question always remains whether arterial spasm is caused by the drug or is an underlying condition. We report a 14-year-old boy who presented with acute chest pain after a single dose of loperamide for acute diarrhea and had no other explanation for the coronary spasm which was clearly documented. A 14-year-old boy was in good health with no history of any chronic ailment. He was prescribed loperamide (Imodium) by a general practitioner for acute diarrhea and flatulence that he had for the last 2 days. He took two capsules of Imodium (2 mg/caps) per oral stat. He developed severe acute chest pain at rest 12 h later. There was no previous history of chest pain, dyspnea, respiratory distress, or fever. There was no family history of sudden death at young age, Brugada syndrome, or familial hypercholesterolemia. 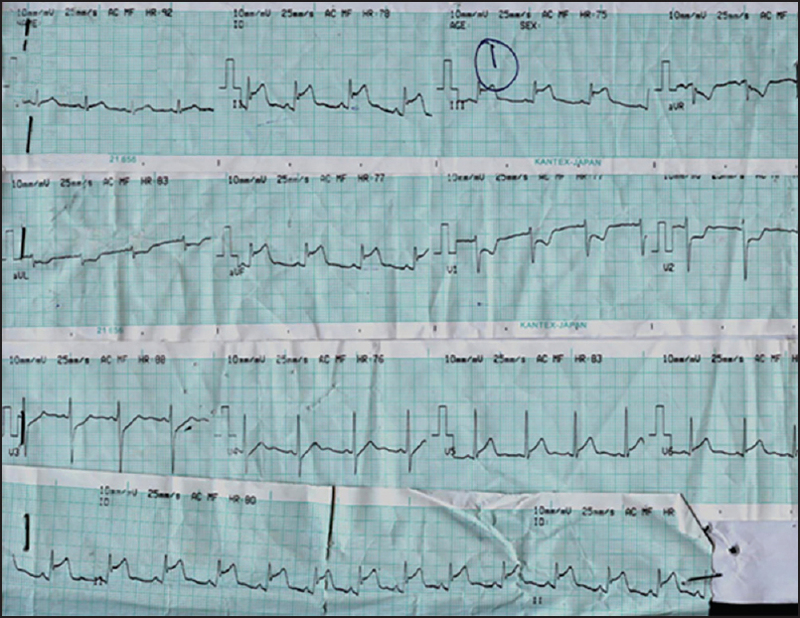 His electrocardiogram (ECG) showed acute ST segment elevation in leads II, III, AVF, and V3, clearly signifying acute coronary ischemia of inferior and anterior walls [Figure 1]. He was taken to the hospital and both troponin T and I were raised >0.2 ng/mL. Creatine phosphokinase (CPK) was 580 U/L (normal: <190 U/L) and creatine kinase MB (CKMB) was 59 (normal: <25 U/L). He was treated for acute ischemia and his ischemic changes on ECG reverted with nitroglycerin within the next 12 h along with improvement in clinical symptoms [Figure 2]. 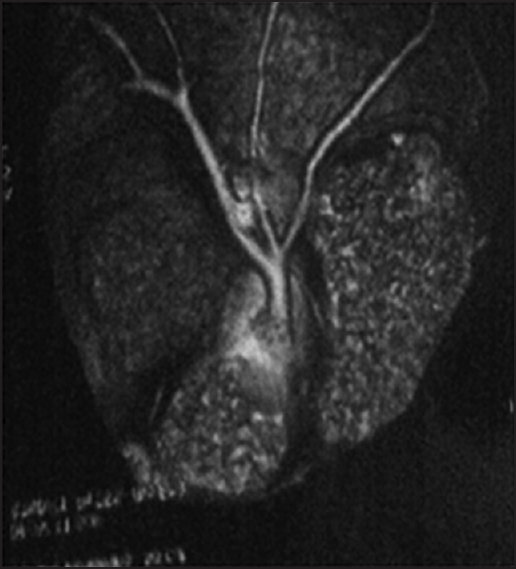 The coronary computed tomography (CT) angiography that was performed subsequently showed a normal coronary anatomy with patency of coronaries [Figure 3] and [Figure 4]. 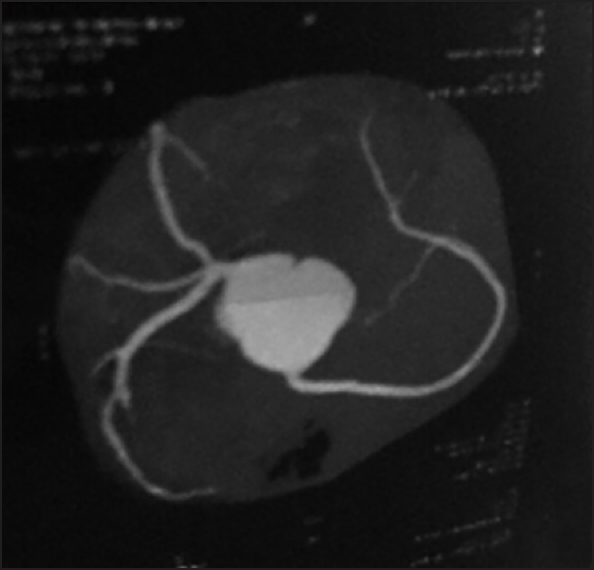 No area of diseased or blocked coronary anatomy was identified but slow filling of coronaries was observed following contrast injection depicting spasm of coronaries. There was no new event over the next 24 h and the boy was discharged. His work-up was done to look for the cause of myocardial infarction (MI). Lipid profile, antinuclear antibody (ANA), erythrocyte sedimentation rate (ESR), C-reactive protein, coagulation profile, protein C and S, renal function, and hepatic function all turned out normal. Echocardiography done during and after hospital stay ruled out any structural lesions and showed normal ventricular function. He was discharged home after 48 h.
Loperamide hydrochloride is a diphenylmethane that antagonizes histamine and interferes with acetylcholine release locally. It has been potentially implicated with coronary vasoconstriction, coronary artery spasm, and MI. All previously related cases have been reported in adult population. We report loperamide-induced myocardial ischemia in a young 14-year-old boy who had no comorbid conditions. The ischemic changes were significant but transient and reverted completely after medical management. Chest pain has been described as a withdrawal symptom related to long term use of loperamide  but in our case, the child presented with a short history and a single dose of drug intake. Loperamide induced coronary artery spasm in the adolescent age group is not reported earlier. We are reporting it as a unique case where coronary spasm induced ischemic changes in ECG after a single dose of Imodium without any predisposing factor. Chest pain is not an uncommon complaint in children and the adolescent age group but mostly it is secondary to noncardiac causes. The cardiac causes must be ruled out in all such children as they can lead to collapse and sudden death. Myocardial ischemia is extremely rare in adolescents but if ECG findings are suggestive, a prompt management followed by detailed investigations is mandatory to identify the cause and save such patients. King CK, Glass R, Bresee JS, Duggan C; Centers for Disease Control and Prevention. Managing acute gastroenteritis among children: Oral rehydration, maintenance, and nutritional therapy. MMWR Recomm Rep 2003;52: 1-16. Statement of endorsement: Managing acute gastroenteritis among children: Oral rehydration, maintenance, and nutritional therapy. Pediatrics 2004;114:507. Li ST, Grossman DC, Cummings P. Loperamide therapy for acute diarrhea in children: Systematic review and meta-analysis. PLoS Med 2007;4:e98. Chen W, Chung HH, Cheng JT. Opiate-induced constipation related to activation of small intestine opioid μ2-receptors. World J Gastroenterol 2012;18: 1391-6. Hanauer SB. The role of loperamide in gastrointestinal disorders. Rev Gastroenterol Disord 2008;8:15-20. World Health Organization. WHO Drug Information. Geneva: World Health Organization; 1990. p. 73. Akaln F. Chest pain in children and adolescents. Turk Pediatri Arivi 2010;45:2-5. Calderon RP, Gonzalo-Garijo MA. Anaphylaxis due to loperamide. Allergy 2004;59:369-70. Srinivasa MR, Phelan C. Death due to anaphylactic shock after ingestion of Imodium instants (Loperamide). Allergy 2007;62:965-6. Hill MA, Greason FC. Loperamide dependence. J Clin Psychiatry 1992;53:450.